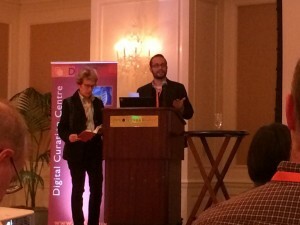 A collaborative research paper on data publishing won the “Best Paper” prize at the 2014 International Digital Curation Conference in San Francisco last week. Eric Kansa presented the paper Publishing and Pushing: Mixing Models for Communicating Research Data in Archaeology, which he co-authored with colleagues Benjamin Arbuckle and Sarah Whitcher Kansa. The three collaborated with a dozen colleagues on a large-scale project of publication, integration, and analysis of datasets from Anatolia. The IDCC paper presented lessons about data documentation and reuse that emerged from the project. Specifically, the study revealed that recording methods researchers assumed were commonplace actually varied widely from researcher to researcher. This kind of “under the hood” access to datasets that helps highlight inconsistencies in recording practices, will help drive improvements in data documentation. The paper argued for the implementation of a combined model of data publishing and version tracking. Data publishing ensures that datasets are seen as professional research outputs (like peer-reviewed publications). Version control, recognizing that datasets are dynamic and can be updated and built upon, ensures that any updates to a published dataset are clearly indicated and justified. Both publishing and versioning of datasets maximizes their potential for reuse. The research paper will be published in the spring 2014 issue of the International Journal of Digital Curation. The study was funded by the Encyclopedia of Life and the National Endowment for the Humanities. Visit the project page to learn more.